This fragrance makes a bold statement with its spicy, herbaceous aroma. Bright bergamot and spicy black pepper elevate its earthiness, tempered with petally magnolia. A base of cedarwood, patchouli and sandalwood give the scent a warm finish. No lingering side effects. Once defiantly naughty, now inescapably chic, and always a rite of passage, Cannabis has never been more à la mode. I came of age in the ’70s, so it’s no surprise that I indulged in an occasional puff. But frankly, I liked the rebellion more than the effects, so my first cannabis chapter closed before it truly opened. When I moved to Amsterdam after college, I was awestruck with everything Dutch, and yes, that included what I think of as Cannabis: Chapter Two. There, hash, as they call it, was both mythic and institutionalized. “Coffee shops” dotted the city, with menus to suit any desired mood. For me, the experience was incredibly poignant, even Proustian, if you’ll forgive the pretension of a post-grad abroad. The coffee shops and the cannabis consumed in and around them became symbolic of an incredible liberation. Robbed of rebellion, perhaps, but fortified with a collective spirit and balanced by a finding-yourself individuality. I never tired of those rich coffee shop aromas—to this day, one whiff instantly puts me back on my bicycle, pedaling along the canals through one of the happiest times of my life. 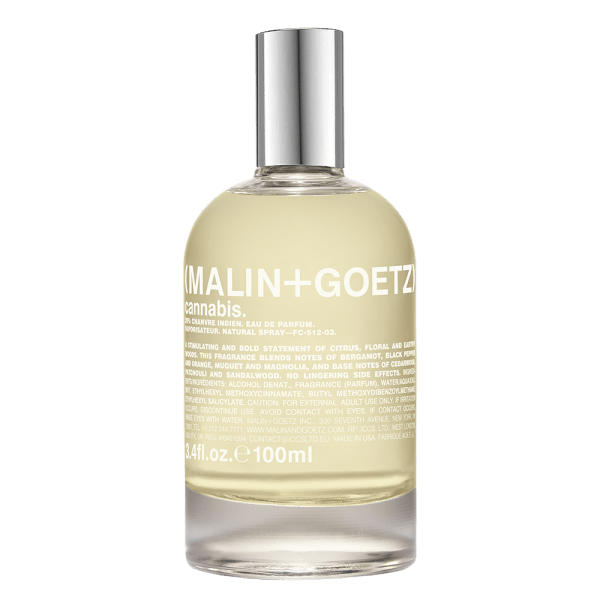 In this spirit, Chapter Three was born: the (MALIN+GOETZ) Cannabis Collection. Because cannabis is a natural medicinal herb, we consider it a perfect “modern apothecary” ingredient, even it if isn’t strictly traditional. Inspired by my memories, our Cannabis fragrance balances spicy herbs with fresh coffee notes and a hint of lingering smokiness (sorry, it’s THC-free). One whiff and you’ll know the feeling. Lazy afternoons. Fading innocence. Endless possibilities.